Essay in Journal of Architecture Vol. 1, No. 2, 2012 (India). After more than 300 years of British colonization, the inclusive and contradictory India was no longer capable of holding herself together. At independence in 1947, India split into two, and subsequently three, independent nations. Thus the capital of Punjab, Lahore, came to be located in Pakistan, while the Indian part of Punjab came to lack a capital. The first Indian Prime Minister, Jawaharlal Nehru, therefore decided to build a new one. He commissioned the American architect, Albert Mayer, who was already involved in several other projects in India, and the younger Polish-born Matthew Nowicki, to make a master plan. But before they had finished, Nowicki was killed in a plane crash and Mayer withdrew from the project. There was, however, already someone who was ready to take over. 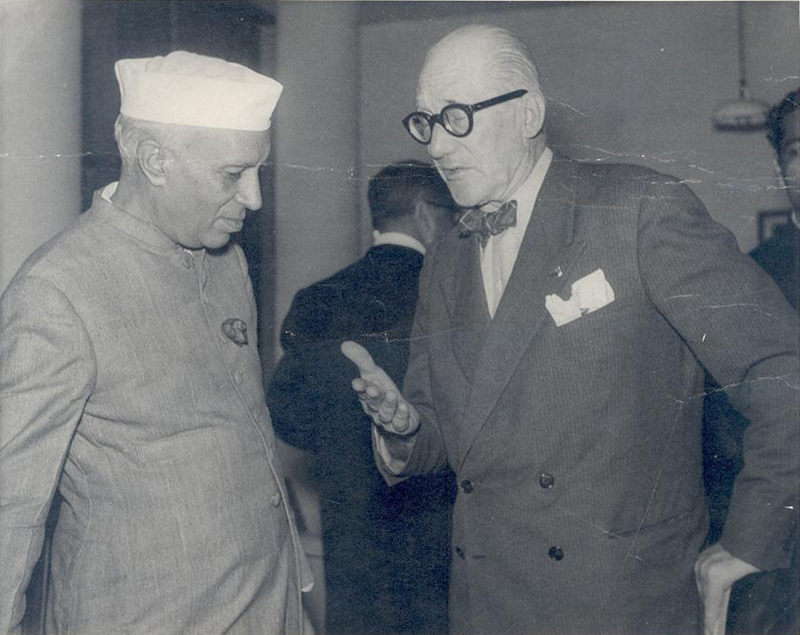 Nehru dreamed of a modern and socially just India, and who would better be able to plan a city that would realize his dream than the “father” of modernism, Le Corbusier, who also shared Nehru’s socialist sympathies? But while Mayer and Nowicki’s plan shared many similarities with the plans for the new American suburbs, Le Corbusier’s “modernist” and “socialist” plan, ironically enough, resembles that of a traditional Chinese imperial city (even if it has been rotated 45 degrees). I came to Chandigarh in October 2010 with the intention of staying for a few days but I ended up staying for half a year, among other reasons, to work on a new plan for the city. It was my Indian friend, Sarvdeep, who had arranged for me to come to Chandigarh. We had met each other in Shanghai, where I had hired Sarvdeep as an intern. He was enrolled at Shanghai’s Tongji University, as an exchange student from a German school of architecture. Before that, he had been working with a large architectural firm in San Francisco as an intern. Sarvdeep is among the millions of young Indians who are seizing the opportunities offered to them by globalization to improve their own and their country’s future. Before he went abroad, Sarvdeep had studied at Chandigarh College of Architecture and when he heard that I was planning a trip to India, he contacted the principal at his old school, Prof. Pradeep Bhagat. Shortly after that, I received an official invitation to give the annual “Le Corbusier Memorial Lecture”. This lecture is held every year in October as part of the celebration of Le Corbusier’s birthday in Chandigarh. It is an honor to give this lecture. The following year, it was given by Pritzker Prize laureate, Eduardo Souto de Moura. The guest of honor at my lecture was an Indian prince who had previously been a minister in another state. At the inauguration ceremony where he and other ministers were sworn into office, he told me, there had been a man that he had mistaken for a servant, who proved to be another newly appointed minister. According to the prince, this man could not even write his own name. I was not quite sure what I was expected to say so I chose to express my admiration for a country that is not only ruled by the highest (the prince), but also by the lowest (the “servant”). The prince looked confused. This was certainly not what he had meant to communicate to me. On the contrary, he had wanted to explain how hopeless the political system in India is. But I thought that it might not be so stupid to give influence to those less fortunate, since they still constitute the vast majority of the population. Then I came to think of my colleagues and myself. As architects, we also belong to an elite. As such, we are interested in the unique and the perfect. But that’s not what most people need. It may very well be that Nehru had envisioned Chandigarh as a model for the development of the rest of India but it is not a city for the common man. It was primarily planned for the elite who belonged to the institutions that were previously located in Lahore. 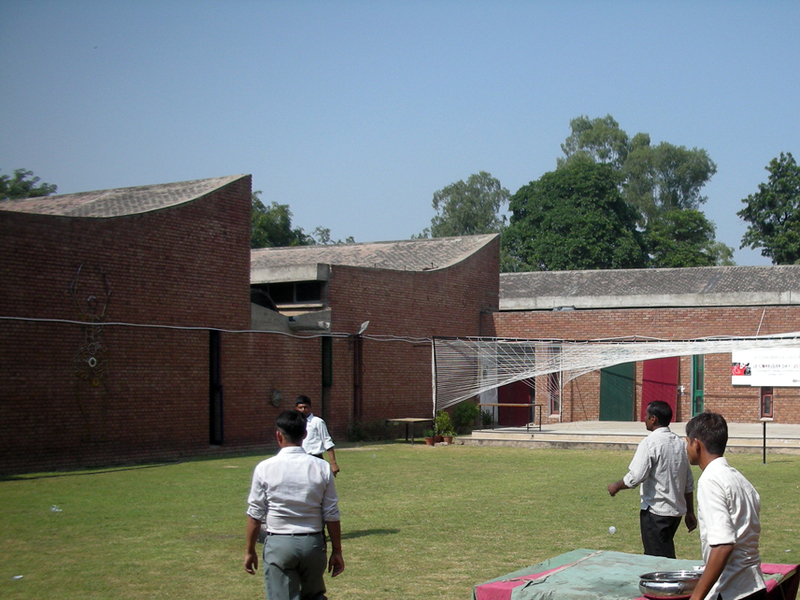 In Chandigarh, these institutions were placed together in a complex, called Capitol, north of the city. Here, Le Corbusier designed three monumental buildings for the Government, the High Court and the Administration. To the north, the Shivalik Mountains form a scenic backdrop and to the east, an artificial lake was constructed. Le Corbusier wanted a fourth building at the Capitol: the Governor’s Palace. But here, Nehru said stop. The Governor (later named the Administrator) is the highest-ranking person in the state but he is not elected by the people. In this respect, he is a bit like a Chinese emperor. In the Chinese imperial city, there was a clearly defined social hierarchy that was reflected in a stringent urban layout of orthogonal streets and square urban districts. At the extreme north was the Emperor’s palace, which was actually a completely autonomous city. Behind it lay the mountains and immediately to the south were the public institutions and the grand residences of the high-ranking officials. Farther south, people were poorer and lived closer together. The poorest lived outside the city. 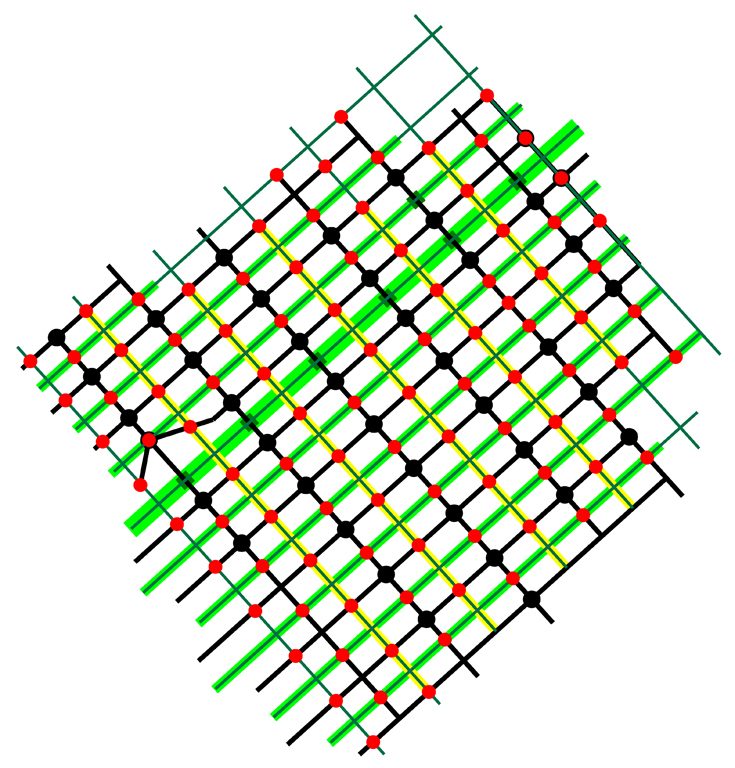 Chandigarh has the same almost quadratic shape as Chang’an and has a similar grid structure. It is not surrounded by a city wall, however, but many of the urban districts, which are here called “sectors”, are actually surrounded by walls. The elite live in large houses with large gardens in the northern sectors, and farther south, people are generally poorer and are generally living closer together. 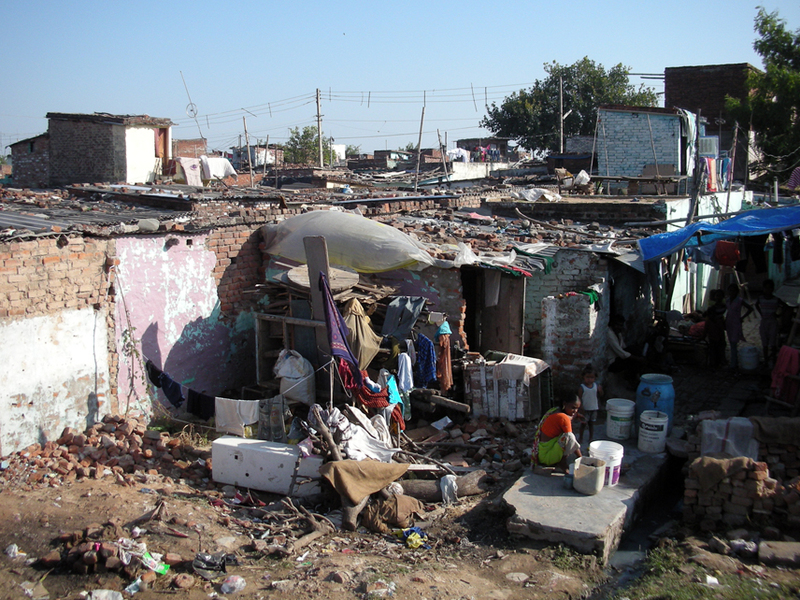 The poorest live in slum settlements, resettlement colonies and villages outside the planned city. 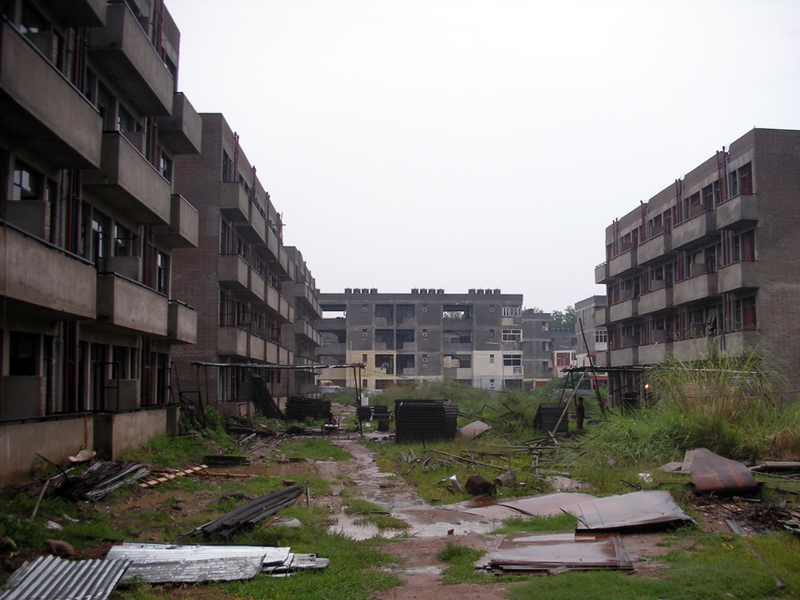 They work for the residents of the planned city but there is no room for them to live inside the planned city. Call centers and high tech industries had not been thought of either so they also have to find their places in the periphery: a periphery that Le Corbusier had envisioned as a broad belt of forest and agriculture, which should prevent the city from spreading! There was even a limit set on the number of inhabitants, i.e. 700,000. Today, there are nearly twice as many, including the inhabitants of the periphery, and during the next twenty years, this number is expected to double again. This kind of rapid urban growth can be observed in many other regions around the world but Chandigarh sets itself apart, not only by its attempts to resist growth, but also by refusing to generate any surplus. It is one of the richest cities in India, but its economy is largely based on the public institutions, which are being paid for by the states of Punjab and Haryana. In addition, the city is being subsidized by the State of India. Apart from presenting the lecture, I had also been invited to arrange a three-day workshop at Chandigarh College of Architecture. It was Le Corbusier himself who had insisted on establishing a school of architecture so that the ideas and experiences from the Chandigarh-experiment could be passed on to future generations of architects. But I soon realized that Le Corbusier’s ideas about “the new” had come to overshadow what is indeed new. Development did not happen in the planned city but rather in the wild chaos that surrounds it. On the Internet, I found a picture to illustrate this. 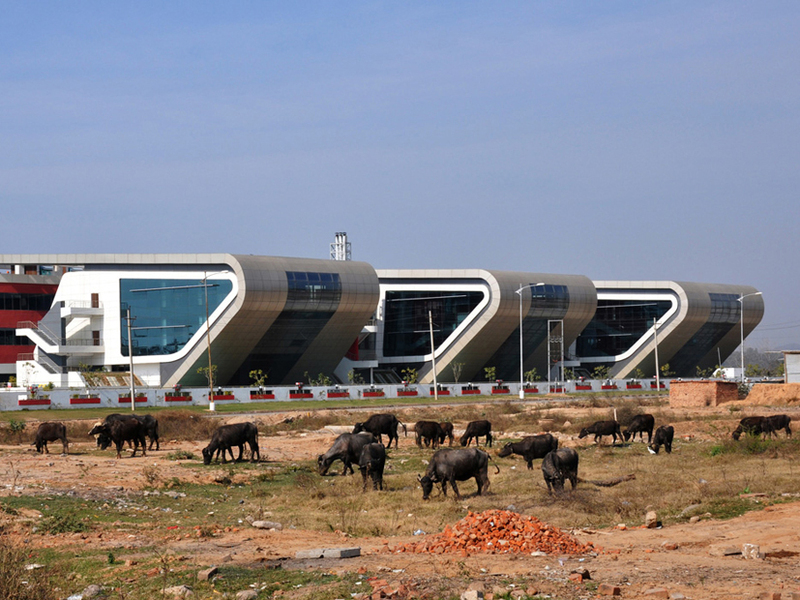 It showed a herd of cows grazing among the ultra-modern office buildings of a global telecom company. I decided that the workshop should be about this: the clash between the global and the local. Here, where the picture had been taken, there had been a forest, where the children from the nearby resettlement colony used to play. Now the whole forest had been cleared to make way for a technology park where well-educated young Indians could work. Next to them, in temporary barracks on an empty building site, lived the migrant workers who were working on the construction of the new office buildings. Opposite, on the other side of a railway track, lived the former slum dwellers in the resettlement colony, and next to them, the current slum dwellers. None of these four groups seemed to have anything to do with each other. The task of the students, therefore, would be to enable and encourage them to meet – because if we don’t know and understand each other, how can we be expected to take care of and feel responsible for each other? So we went there to talk to them – more than a hundred students and teachers from the school. The IT workers were friendly and joyful but they were constantly glancing at their watches. Everything, including time, had been planned for them: where and when to work, eat, socialize and exercise. And as if to make a point of this, barbed wire had been rolled out on top of the walls surrounding each building, surveillance cameras had been installed at each corner and guards had been posted at the entrances. The slum dwellers were also friendly and joyful, even though their lives were more based on chance, as could be seen in how they created their dwellings out of disparate and fragmented elements. But they, too, were trapped in a certain order, so tellingly illustrated by the women sitting in a huge pile of plastic waste who were busy assorting plastic bottles and plastic bags. At the school, they seemed excited to have someone from the outside taking a fresh look at things. So they asked me if I wanted to stay. And I did. Until then, I had been staying in the city’s official guesthouse but now the Indian president came to visit, so I had to move into the boys’ dormitory. Later, I rented the top floor of a house from Mr. Malhotra, an elderly gentleman who lived a very simple life and whose company I greatly enjoyed. In the midst of busy people honking aggressively at each other in the traffic – and shouting and gesticulating – Mr. Malhotra seemed to have found a peace that no one could pull him out of. One day I visited M.N. Sharma – a member of Le Corbusier’s original team. He had been the first Indian chief architect of Chandigarh and he told me that he had a good friend in Denmark whom he had often visited. It turned out to be the architect – and Le Corbusier expert – Mogens Krustrup, who lived in the same village that I grew up in. Furthermore, it turned out that one of M.N. Sharma’s close childhood friends from Lahore was none other than Mr. Malhotra, with whom I was currently staying! 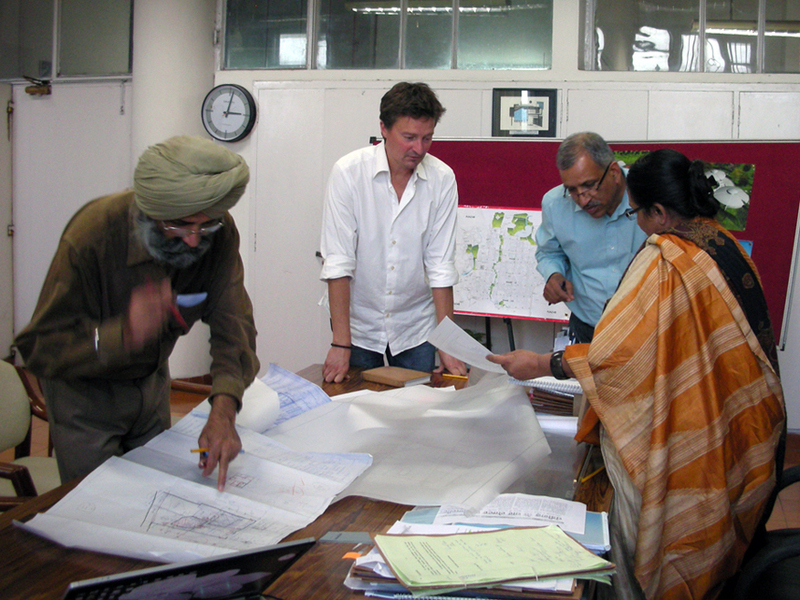 Through the school of architecture, I came in touch with the current chief architect of Chandigarh, Sumit Kaur. And, together with my students, I began to work on various projects for the city’s new master plan, for which she was responsible – this was the first such plan since Le Corbusier’s! For three days, Sumit Kaur, her assistant and I drove around town in her little official car with a flashing red light on the roof. One of the places we visited was Burail – the only original village that has survived inside Le Corbusier’s planned city. The narrow and shady pedestrian streets were full of life and activity, but Sumit noted, with great concern, the numerous violations of various rules and regulations. However, she later said it might be better to preserve the village. Preserve it? Had she otherwise planned to bulldoze it? The broad, straight roads were no less crowded. In Chandigarh, there are more motor vehicles per capita than there are in Denmark, which is unusual, not only because India is a “developing” country but also because there are usually fewer cars per capita in a given city than there are in a given country. The public transportation system is lousy and there is no reason to think that it will improve much – not even with large investments. Because the solution that is currently being discussed is to establish a metro system, which doesn’t seem to make much sense in a city with no points of densification. With relatively simple means, it ought to be possible to achieve significant improvements, either by upgrading the existing system of buses or by establishing a new system of trams. But the advantage of the metro is precisely that it is both extremely expensive and complicated to construct, thus providing multiple opportunities for kickbacks. It is apparently of less importance that only very few people would benefit from this solution. At my office in Shanghai, we had once made a project called “Green Streets of Shanghai”. The idea of that project was to expand the existing network of elevated highways so that all traffic could be removed from the streets on the ground level, which could then be transformed into green areas. I had initially thought that this was an original idea but now I realized that something similar had been proposed by Aditya Prakash in Chandigarh many years before. 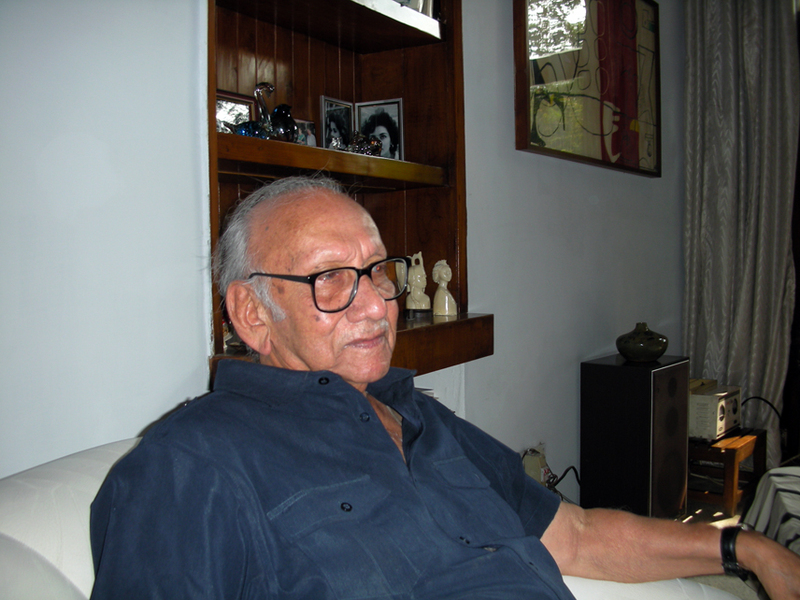 Aditya Prakash, who was also a member of Le Corbusier’s original team, was the first principal of Chandigarh College of Architecture and was the only person who had dared to criticize Le Corbusier’s ideas. Prakash had proposed raising all the roads between the sectors above ground level. As with the metro, I don’t think it makes economic sense in a relatively low-density city like Chandigarh but Prakash was nurturing many other interesting ideas and it’s a shame that no one was listening to what he was saying. He died a couple of years ago, at the age of 85, during a tour of India with his theater troupe! Somewhere, Prakash had mentioned that, as kids, he and his cronies sometimes slept outside in the streets. Following this thought, we proposed to make one of the sectors completely car free, as an experiment. 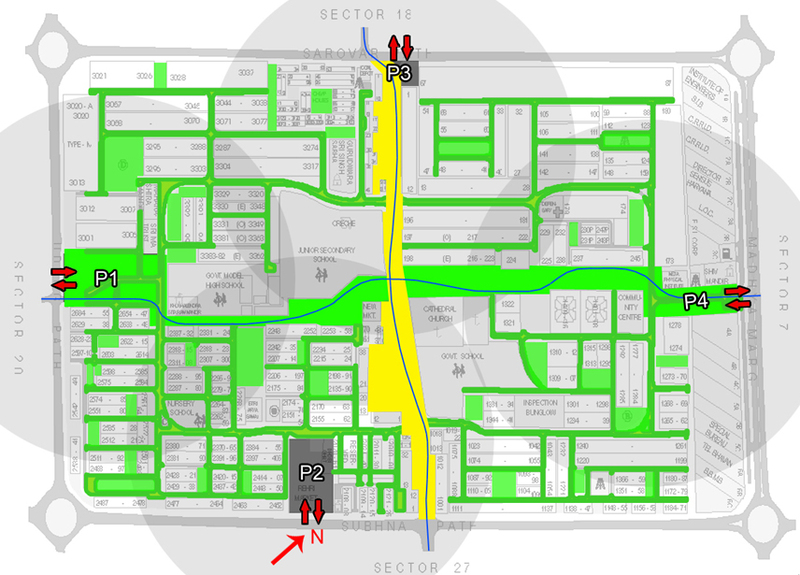 Each sector has four entrance points and by providing car-parking facilities at each of these, the maximum walking distance from home to car would be no more than 300 meters. Electric rickshaws running on solar power could provide for local transport within this sector and most of the asphalt, which contributes significantly to the overheating of the city, could be removed. In return for having to make a short walk to and from the car, children would be able to run around freely outside, air quality would be improved and noise pollution reduced, the city would be cooler and its impact on the climate would be restricted. This was not what the master plan committee wanted! But recently, the High Court ordered the authorities to make one of the sectors car-free, as an experiment! I also worked with a local NGO on a proposal to create vertical kitchen gardens for the slum dwellers that are being resettled in endless rows of four-storey apartment blocks outside the planned city. Here, agriculture has virtually disappeared and these people are particularly vulnerable to the fluctuating food prices and dependent on the government’s central food stocks. It’s not just agriculture that has disappeared from the periphery of Chandigarh. It is also the forest. The planned city is, however, a good example of how to integrate forest in the city – although this was not entirely planned. It is an active branch of the administration that has ensured that about one-third of the city’s surface area is now covered with trees (most of them in the affluent northern part of the city) and along with the chief architect, we worked on a proposal to increase this to 50 percent. Imagine a city that is half forest! A somewhat similar idea appeared in another project I worked on for Kamal Meattle, a “green” developer in Delhi, albeit in a different shape and on a different scale. 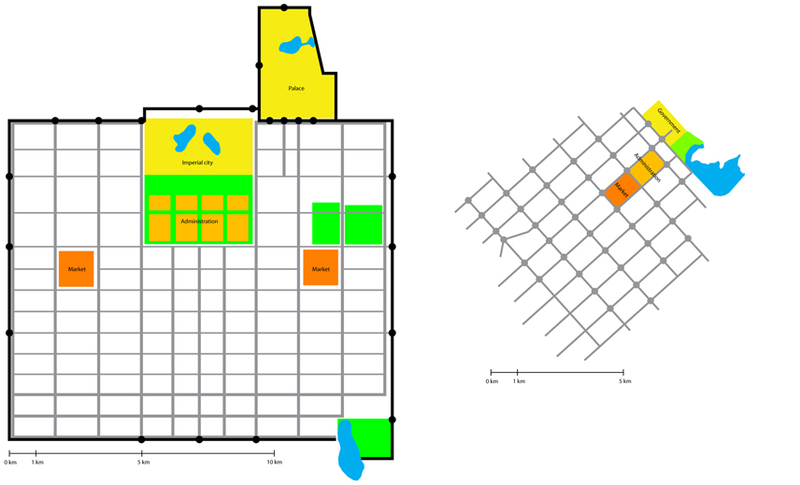 Mr. Meattle wanted to build the world’s most energy-efficient large office complex. He had lost nearly half his lung capacity due to the air pollution of Delhi and the doctors had warned him that he would die if he did not move somewhere else. But instead of moving away, he adapted, instead, an invention to purify and produce clean air with the use of plants, which was originally developed by NASA for possible future extra-terrestrial life, to the contemporary context of Delhi. Together with Sarvdeep, I then made a proposal for the interior design of Mr. Meattle’s office building using plants as removable “walls”. In Chandigarh, I also worked on an idea to convert the Capitol complex into a “Le Corbusier World Culture Center” in order to stimulate tourism – and the local economy. Here are some of modernism’s most famous buildings, but nobody – other than the people who are working there and the people who have some kind of business there – ever sees them anymore. They are no longer suited for their original purposes and their secluded location only further insulates the city’s rulers from the city. But the people in power are not interested in changes. 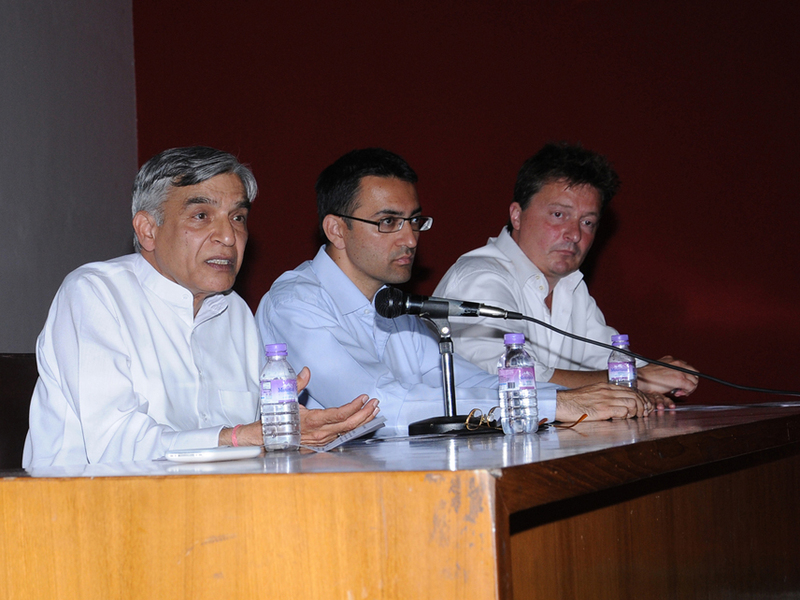 I discussed this issue of change versus preservation on one of my last days in Chandigarh, at a two-hour public debate with the American professor, John Bass, and Indian Minister, Pawan Bansal. Bansal said that the Chandigarh-experiment had failed. After half a year in town, I tended to agree but I was surprised to see that a minister who was living there himself and who was standing in front of a large audience of potential voters from the city would openly admit this. It seemed as though he actually wanted change. Unfortunately, the people who don’t want change have an even greater authority on their side: Le Corbusier has been elevated to a kind of god and his words have become law. He laid down those laws in what is called the “Edict of Chandigarh”, the object of which “is to enlighten the present and future citizens of Chandigarh about the basic concepts of planning of the city so that they become its guardians and save it from the whims of individuals”. The Edict says, for instance, that no personal monuments (statues) may be erected in the city. 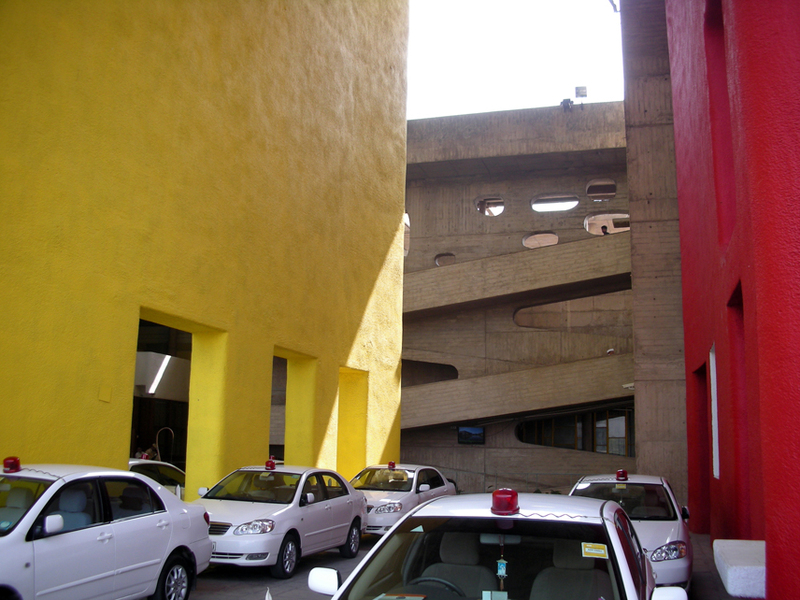 On the other hand, it can also be said that the whole city has become a personal monument to Le Corbusier. He wanted to change the world but he didn’t want anyone to change what he had created. Hi, I live in Chandigarh. I enjoyed reading the article and discovered few facts that I was previopusly unaware of. The slum area you showed was flattened and the slum dwellers were moved to the housing project shown in the last picture of your article. I haven’t heard any news about the car-free sector experiment, perhaps you can share the status on that, if you were alerted? I totally agree with you on the point of public transportation and also that metro isn’t needed, yet; and that with improvement in existing transportation system, problem can easily be tackled. Thanks for the article. Cities grow when perceived with compassion for people, but take a retrograde path way when natural resources, its people and its rhythms are suppressed. Not for nothing is it worthwhile to understand why certain civilizations have been lost because there was a lack of understanding of the ABUNDANCE in their own civilizations by their own rulers. This article portrays the authenticity of the Architect, who has felt and observed much through his itinerary in Chandigarh. I was reminded of “Sophie’s World” when I read it.